In Peru, we enjoyed what we didn't realize would become a bucket list experience of a lifetime! While perusing TripAdvisor, we noticed that tour company America Viajes offered a tour of swimming with the sea lions. To be honest, we didn't expect that much because we had never heard of such an experience before. We figured that we would be lucky if we were able to see a handful of sea lions nearby the boat, but we didn't expect much more than that. Boy were we in for a surprise! You can swim with the sea lions of Peru in Callao! We were picked up from our hotel at about 9:30 am and there were about five other tourists on the trip with us. We settled in the van for a 25 minute ride to Callao, where we would be boarding our boat to go visit the sea lions in Palomino Island. 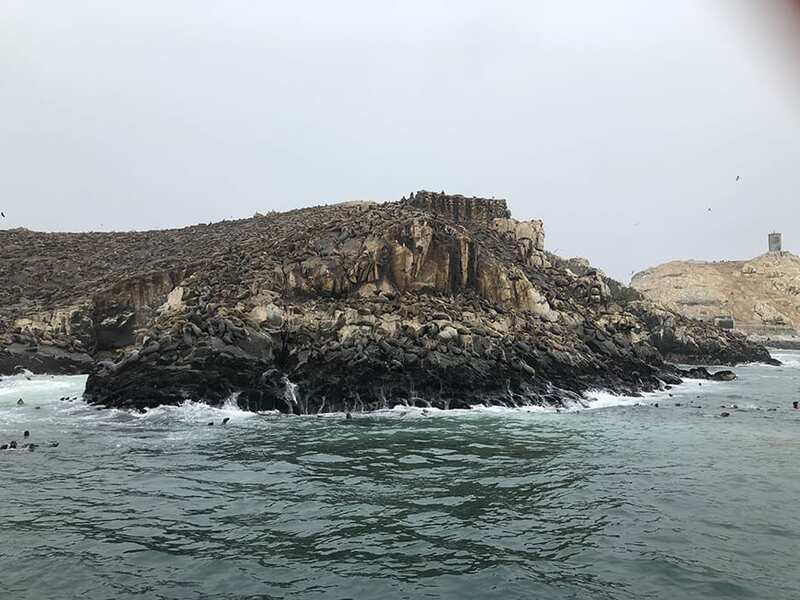 During the 30 minute boat ride down to Palomino Island, where the sea lions resided, our tour guide gave us a comprehensive historical background on the history of the various islands and the areas that we were passing. Our guide Wilson shared with us that Peru is made up of 24 different regions. We were currently in the region of Callao, an independent region which is taxed different than Lima. On our tour we would be visited four islands. One of the islands had a particularly fascinating history, it's kind of like the Peruvian Alcatraz. A huge tragedy occurred which shut the prison down when a group of terrorists called the Shiny Path terrorists took over the prison. The Peruvian navy later bombed the prison, killing around 200 prisoners and guard, one of the worst human rights violations in history. Another of the islands is known as Guano island aka Poop island, because large amounts of Guano (bird poop) are harvested from the island! Guano is a powerful, natural fertilizer. The best guano is produced by the following birds: the Peruvian booby, pelican and Guanay cormorant. Once we saw Palomino Island, we were mind blown! The little island was literally covered with sea lions, I mean every single inch! It was far more sea lions than we expected, at least 5000 in total. We visited in September, which is their mating season, and there were little baby sea lions on the island also. There were no sea lions in the water where we parked the boat, but once we jumped into the water (freezing!! ), the sea lions started hopping in the water and swimming towards us. They were as curious about us as we were about them! It was so cute, they would come up close and bop our feet, dive and swim around, make their strange mooing noises, it was the most magical experience of my life! 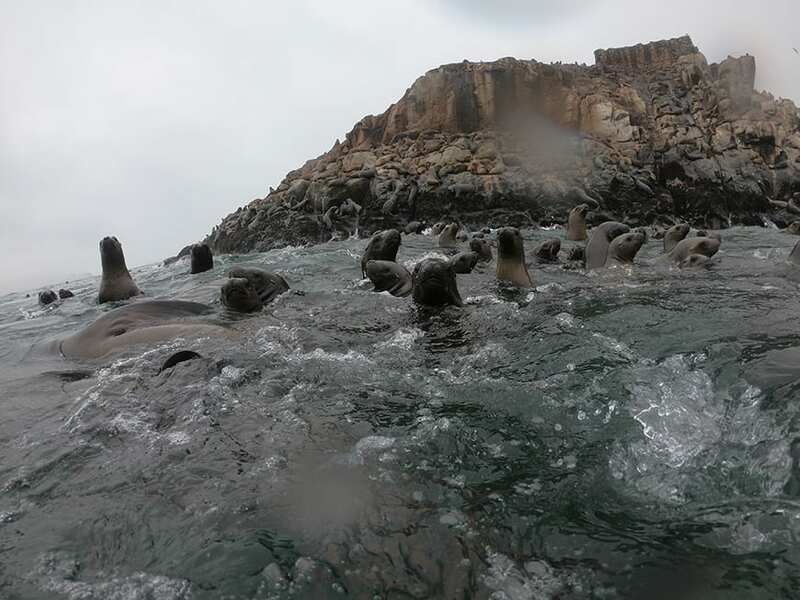 The sea lions in Callao, Peru have no natural predators and their main source of food are anchovies. They live all the way up to 26 or 27 years of age. 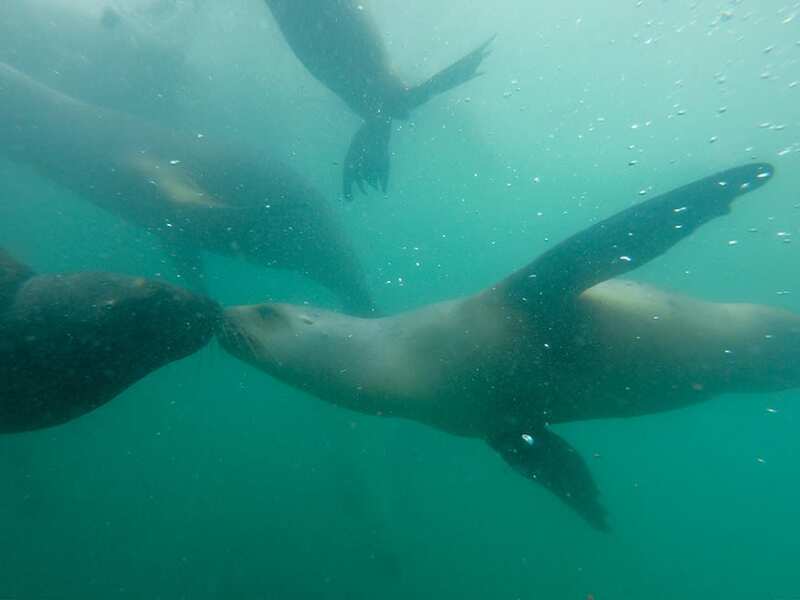 This is an amazing snorkeling experience with the sea lions of Peru. The tour just has one snorkeling set on hand so if you want the full snorkeling experience I would recommend bringing your own snorkeling gear to this excursion. It's a can't miss experience, there are even more sea lions when you dip your head underwater than you see on the surface! Make sure to bring your gopro also. The sea lions are often compared with seals but they are actually quite different anatomically. Sea lions are bigger, have larger faces, have ears, and have much longer necks. Seals barely have a neck and don't have ears, they just have holes. 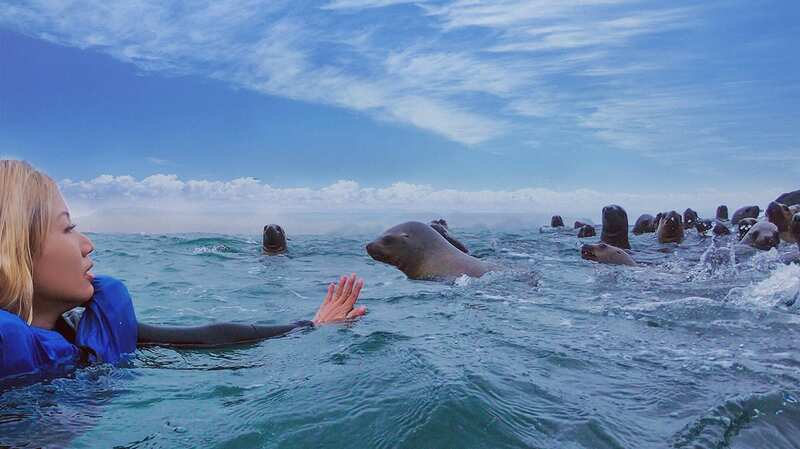 Yes, it is safe to swim with the sea lions of Peru! They are super playful and are just curious to get to know you better! This is truly a once in a lifetime experience. 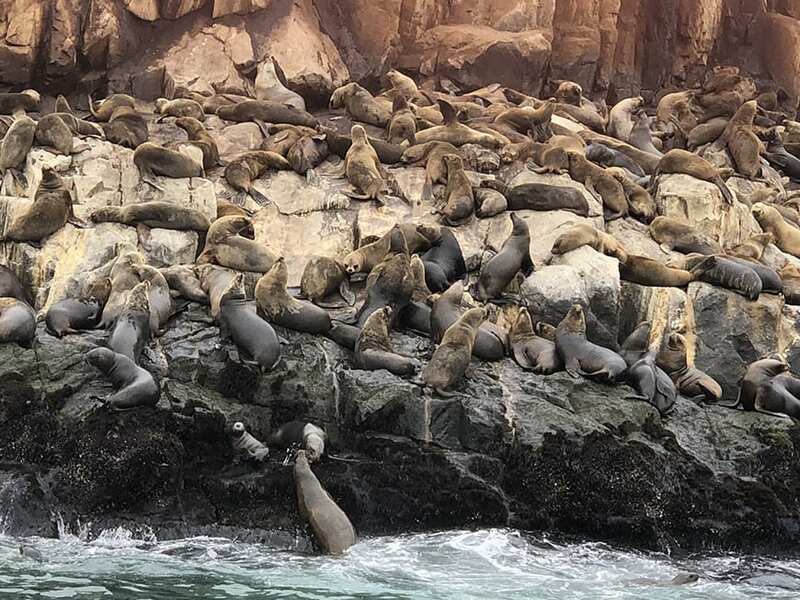 If you visit Lima, Peru and love animals, you MUST go on this sea lion excursion from America Viajes! America Viajes provided us this tour free of charge, but of course, all opinions are my own.